Its barely a month, when Honda Mobilio was first launched in India. The car maker had introduced it in three trim levels along with an exclusive RS sporty variant. 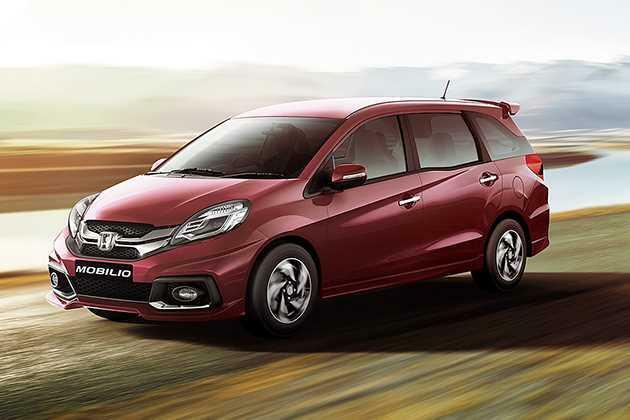 Now, the car maker has officially rolled out optional variants in this series among which Honda Mobilio RS Option i DTEC is the fully loaded trim. This new variant is powered by the same 1.5-litre, i-DTEC diesel engine, which is powering the other existing diesel variant. The manufacturer has introduced this optional trim with a several added features like AVN (Audio Video and Navigation) system and rear parking camera, which makes it more competitive in its segment. At the same time, its interiors have been updated with wooden finish given on the dashboard and door panels, which gives a refined look to the cabin. The remaining aspects like comfort and safety features have been retained from the existing RS trim. It also comes with RS exclusive bumpers, tailgate spoiler and side sill garnish, which gives a sporty appeal to its exteriors. The car maker will start deliveries of this sporty version of Mobilio from September later this year, which is just few weeks away from now. It will now compete with the likes of Toyota Innova, Maruti Ertiga and Nissan Evalia in the MPV segment. This newly introduced trim comes with a slew of sporty cosmetics, which gives a distinct look to its exteriors. Its front profile is fitted with a large headlight cluster, which is powered by projector type halogen lamps and turn indicators. It surrounds an 'RS Type' radiator grille that is treated with chrome. Below this, there is a stylishly structured bumper that is designed with a bigger air dam along with a pair of fog lamps. This body colored bumper is integrated with a spoiler and is affixed with chrome strip, which gives its dynamic look. It has a lustrous side profile with well molded wheel arches and expressive lines. This variant also comes with chrome door handles, body colored ORVM caps with integrated turn indicators and glossy black pillars. The car maker is offering this trim with a set of 15-inch 'RS Type' alloy wheels, which are covered with 185/65 R15 sized radial tubeless tyres. The main highlight is its asserting rear profile where it comes fitted with radiant taillight cluster and an expressive tailgate. Its windscreen is quite large and it is accompanied by a spoiler with high mount stop lamp. The rear bumper is fitted with expressively designed strips along with a pair of reflectors. The new Honda Mobilio RS Option i DTEC trim has an ample leg and shoulder space has a dual tone beige color scheme. It is further emphasized by wooden finish given on the center fascia of dashboard and on door panels. As a result of this, the dashboard gets a classy appeal and gives a plush look to the interiors. The car maker has now installed an advanced AVN system in the dashboard that features a 15.7cm display, which provides control switches for audio and Bluetooth functions. Apart from these, the remaining aspects of this trim have been retained from the existing RS variant . The seats are well cushioned and have integrated head restraints. Both the second and third row seats have reclining function where in the second row seat also have sliding facility. At the same time, its driver's seat has height adjustment function, which adds to the convenience. On the other hand, this trim gets several utility based features like front and rear armrest, rear AC vents, split folding third row seat and front seat back pockets. This newly introduced variant is powered by the same 1.5-litre, i-DTEC diesel engine that is integrated with common rail direct injection technology. It is based on DOHC valve configuration with four cylinders and 16-valves that displaces 1498cc . It can unleash a maximum power of 98.63bhp at 3600rpm that results in a peak torque output of 200Nm at just 1750rpm. The car maker has paired this motor with a five speed manual transmission gearbox that distributes the torque output to its front wheels. At the same time, it can return a maximum mileage in the range of 18.3 to 24.3 Kmpl, which is quite good. This vehicle is blessed with a proficient braking mechanism in the form of front disc and rear drum brakes . It is further incorporated with an anti lock braking system and electronic brake force distribution, which augments this system. As far as its suspension is concerned, its front axle is fitted with McPherson Strut, while the rear axle gets a torsion beam that keeps the vehicle well balanced. On the other hand, this trim also gets an electric power steering system, which offers good response and makes handling quite simpler. This Honda Mobilio RS Option i DTEC is the fully loaded version that has several advanced features. It comes with an AVN system including 15.7cm color display that is integrated with in-car entertainment system and a satellite navigation with voice guidance. It also provides touch controls for Bluetooth and audio system and supports video files as well. This trim gets a list of features including an air conditioning system with heater, a rear view camera , power adjustable external mirrors, central locking system, front and rear power windows with driver's side auto down function, driver's seat height adjuster, fuel consumption display and a tachometer. It also has features like front sun visors with passenger's side vanity mirror, cup holders, center armrest and accessory power socket. The list includes airbags for front passengers, front seatbelts with pre-tensioner and load limiter, ABS with EBD, speed sensing auto door lock, driver's seatbelt reminder, security alarm, high mount stop lamps and an engine immobilizer. This vehicle comes with an advanced ACE body structure that features impact protection beams and crumple zones, which absorbs most of the jolt caused in case of a collision. 1. Low cost of maintenance is its main advantage. 2. Plush interior design with a huge cabin space. 1. Price tag is quite expensive. 2. Ground clearance is very low.